Barrister Abdullahi Mukhtar was born on 11th August, 1967 and Hails from Kubau Local Government of Kaduna State. He holds a Bachelor of Law degree from Ahmadu Bello University Zaria, a Post graduate Diploma in International Law and Diplomacy and a Master’s Degree in International Affairs and Diplomacy. He is a bonafide member of the Nigerian Bar and a fellow of the Chartered Institute of Administrators. He began his carrier in Hajj industry at Kaduna State Muslim Pilgrims Welfare Board as Director Operations between 1994 and 1997. He was a consultant to Chanchangi Airlines during the 1998 Hajj Operation and the Presidency, Office of Pilgrims Affairs Abuja for the Hajj 1999 Operations. He was appointed the Executive Secretary of Kaduna State Muslim Pilgrims Welfare Board as from May 2003 to June 2011. 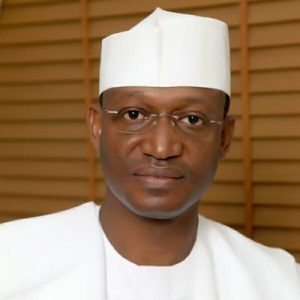 He was later appointed Commissioner, Operations from June 2011 to 24th May, 2015 and later the Chairman/CEO National Hajj Commission of Nigeria, from 25th May 2015 to Date. His achievements in Hajj qualified him for national recognition where Late President Umaru Yar’adua bestowed him with the National Honour, Member of the Order of the Niger (MON) in 2010. This is in addition to numerous other recognitions in terms of awards and honours locally and internationally. Alhaji Ahmed Maigari was born in the early 60s in Mayo-Belwa which is now in the present day Adamawa State. He is from Yola South Local Government Area in Adamawa State. He had is primary education in Musdafa Primary School Yola and his secondary education in Yelwa Government Secondary School, Yola. He then proceeded to University of Maiduguri where he obtained his first degree in Public Administration. Keep the records and conduct the correspondence of the Commission. Serve as the Secretary at all meetings of the Commission. The Office coordinates the drafting of Hajj report. Coordination of the inauguration of Operational Committees. Perform such other duties as the Commission or the Chairman may from time to time direct. Nasir Habeeb was born on 1964. He attended primary school Jahun in Jigawa state between 1969- 1976. He attended secondary school between 1976- 1981 and proceeded to Sokoto University between 1983-1988, Nigeria law school –1988-1989. He did NYSC between 1989-1990. Kano state Ministry of Justice 1990- 1991. Jigawa state Ministry of Justice 1991-2005- left as assistant Director in November 2005 to Federal Ministry of Justice on transfer of service. Worked on posting to Federal Ministry of lands – 2007-2010, Federal Ministry of petroleum – 2010-2014, legal drafting Department – 2015- 2017, Office of Accountant General – 2014-2015. Attend meetings and serve as committee member act as member to Ministerial Tenders Board meeting, etc. Fatima Sanda Usara is a native of Kebbi State. She obtained B.A Hons in English Literature from University of Maiduguri. She proceeded to Kaduna State University (KASU) to obtain M.A in English Language. She is a seasoned journalist, a creative writer, poet, wife and mother. She enjoys writing.